What is it with Ohio? Both their major league ball parks are named after (or more accurately, when one considers the the economics of the transaction) by insurance companies. 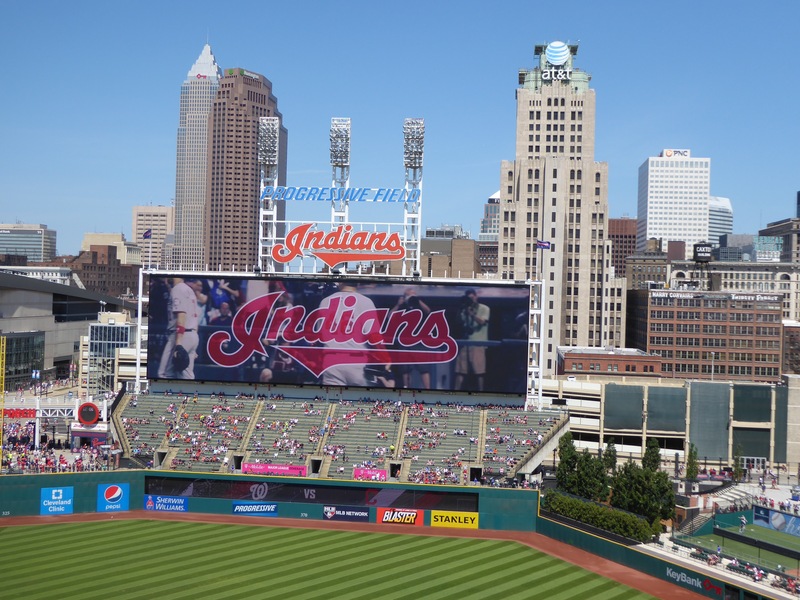 Cleveland’s is now known as Progressive Field, formerly (and with a semblance of human connection) Jacobs Field or “The Jake.” The original name honored team owners Richard and David Jacobs, and the stadium bore that name until the naming rights were sold to Progressive Insurance. Guess what name they picked! It is part of a sports complex that includes Quicken Loans Arena (just rolls off the tongue, don’t it?) where the NBA Cavaliers play their home games. This game was the second consecutive inter-league contest, but, this one being hosted by the American League team, the DH was used, whereas in Pittsburgh, the pitchers batted (how many of you picked that up in the last post where I mentioned that Liriano homered?). It was also the only day game on my schedule. The Washington Nationals and their ace, Stephen Strasburg, took on the Indians and it wasn’t really a contest. Strasburg came into the game with a 13-1 record, and he dominated the Tribe. He left after seven innings with a 4-0 lead. The Nationals relievers managed to give up a run to spoil the shutout, but Strasburg’s win was secured. Indians starter Carlos Carrasco is unusual in that he works from the stretch, even with none on base. That is the practice of relievers, but not of starters. Most starters use a fairly precise windup, and many think they can generate more velocity from the windup than from the stretch. One need only watch a few of the flame-throwing relievers in the game today to put the lie to that myth. The only pitcher in the Bigs using an old style windup today is Ross Ohlendorf, and you can see a clip of that here. 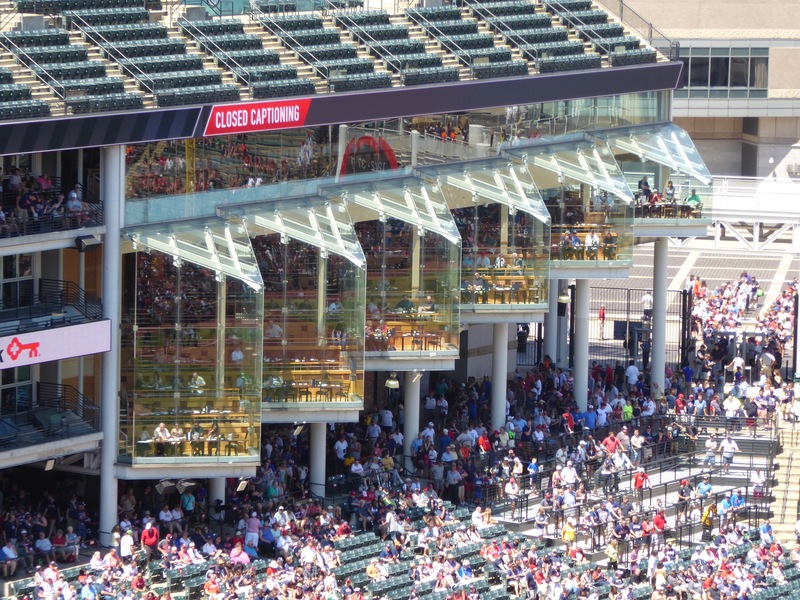 One feature at Progressive Park that I’ve seen nowhere else is these wild looking suites. I puzzled over them a while and couldn’t decide what the view would be and whether I’d like it. Now to the food. Cleveland is far in the lead. They have cheap dogs (though you have to pay extra for toppings like kraut). They have crazy dogs – one topped with pickle relish, peanut butter and sriracha sauce; one with pulled pork, cheese, greens, onions, BBQ sauce and coffee! ; and the killer – pimento mac and cheese, bacon and Fruit Loops. Huh? There was a good variety of Mexican food. And believe it or not, there was one stand selling a variety of grilled cheese sandwiches. The one I fell victim to sold specialty dogs, including the one I chose – the Reuben dog. Now the Reuben is one of my favorite sandwiches, if it is done well, so it would have been wrong for me to pass this one up. It was a hot dog topped with corned beef, sauerkraut and thousand island dressing. And boy was it tasty! The corned beef was cut in chunks rather than slices, and it wasn’t the best quality corned beef I’ve ever had, but the overall effect was pleasing. Until I was nearly done. That’s when I realized that, between the dog, the kraut and the corned beef, I had just consumed enough salt to last me a week (well, maybe a couple of days). The rest of the day was spent drinking water. Oh well. My hometown! I saw Sam McDowell pitch in a snowstorm ( might have been liquored up) and learned much of what I know about racism in the old Municipal Stadium, which seated something like 80, 000 which made it pretty easy to get really close seats after about the second inning, with crowds of 2,400. And it is so stinking boring in Ohio that of course they have to go to crazy food for entertainment! And you were “insured” of seeing a good game. Wish I were there. The blog is great. Happy bobbin.